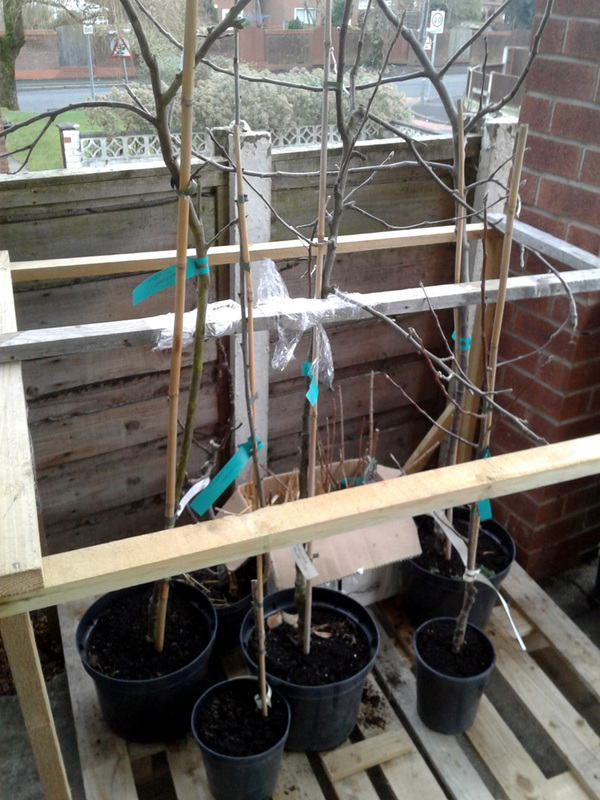 Earlier this year I talked about establishing our air-pot mini-orchard; three apples and a morello cherry that we’re growing in Air-Pot containers. At the time I mentioned that I was planning to use a Modified Lorette system of pruning in an effort to develop the best possible network of fruiting spurs without over-taxing the trees. 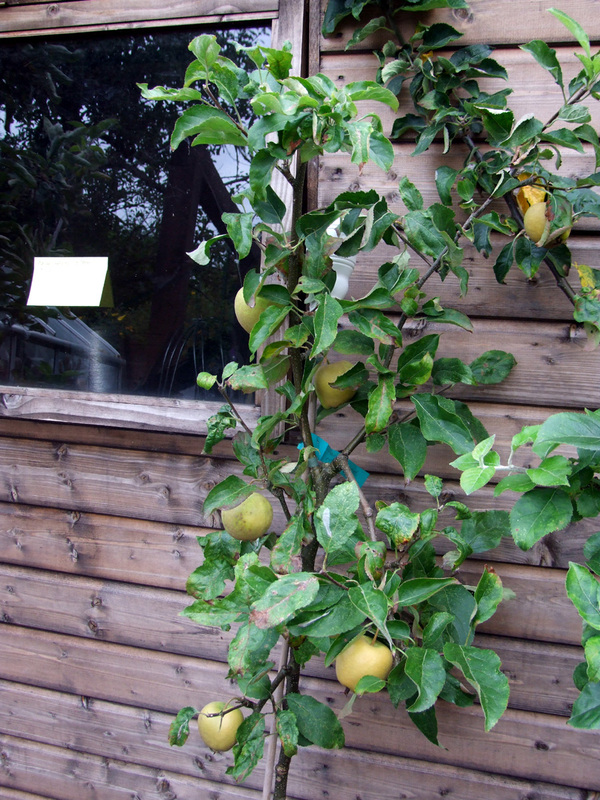 This is a pruning method that seeks to establish a network of short, fruiting spurs along the length of a tree’s main branches, which makes it suitable for trained forms such as cordons, espaliers or step-overs (a.k.a. horizontal cordons). To be honest, he trees we were supplied with are probably better suited to growing in the ground as small standards than as pot cordons. When they arrived they already had quite well-developed branch systems and a couple of their trunks aren’t particularly straight, either. But that’s the risk you take when you mail order, without picking out the specimens yourself. Caveat emptor and all that. 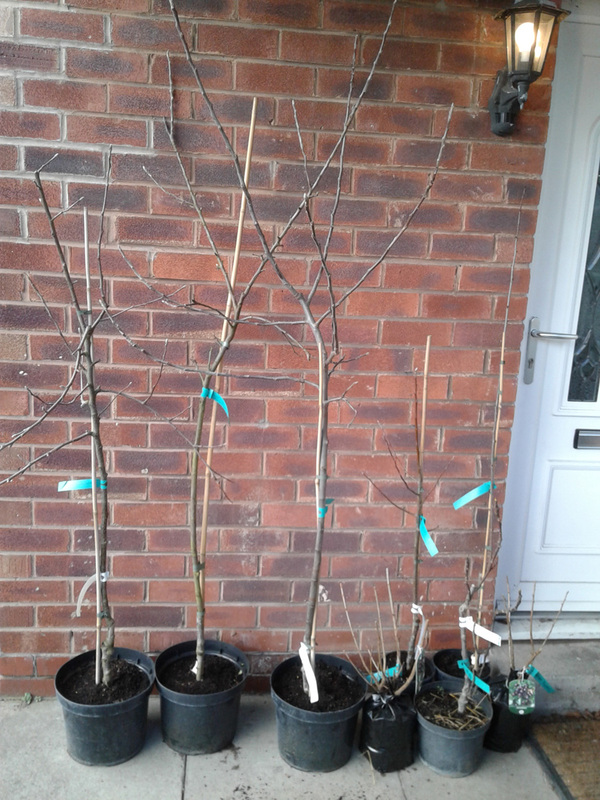 If the worst comes to the worst, we’ll transplant these trees to the allotment and start again with more suitable cordon stock. Persevering for now, the plan for the next few years at least is to restrict the trees’ top growth and keep them at around 5′ to 6′ (1.5m – 1.8m) or thereabouts in height, hopefully allowing their root systems to develop nicely within the Air-Pot planters, and their trunks to thicken enough to take the weight of additional branches. So, armed with my summary notes gathered from those articles, I set out last Thursday – a little late in the season perhaps, but hopefully not too late – to assess the state of our own trees and decide what sort of pruning cuts I needed to make this season. Admittedly, I’d already made a few snips earlier in the summer, mainly to control and cut back a few aphid-infested sections, so there wasn’t going to be a lot of new pruning to do. 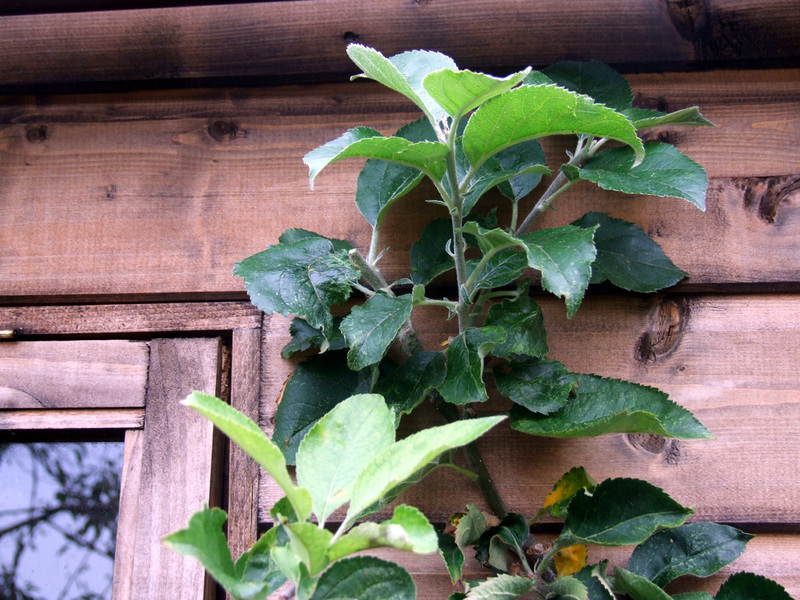 Strong growth and a few good apples, for a decent first year’s performance. This tree was probably the best-balanced of the three in terms of its first year growth versus fruit production. It leafed up well, produced plenty of blossom and we had four good-sized and very tasty (if not particularly aromatic) apples from it. 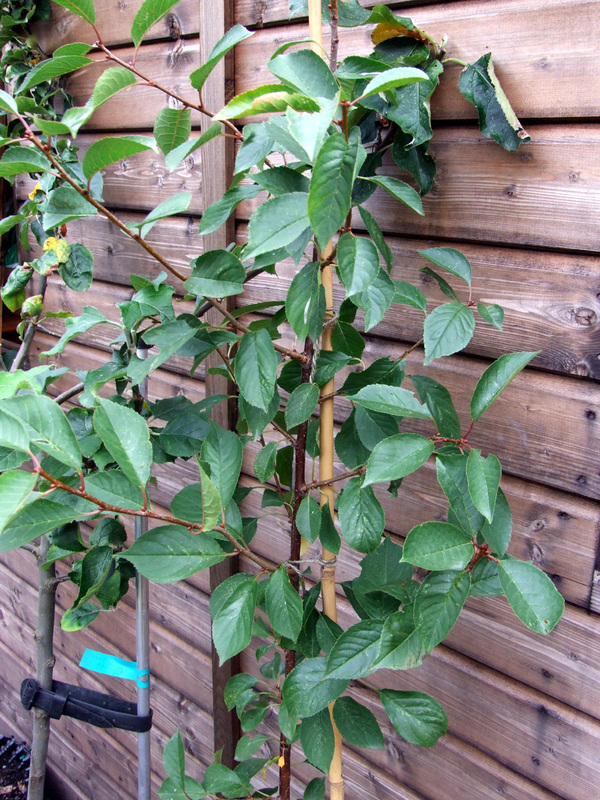 One thing we weren’t made aware of when we bought our trees is that the Cornish Aromatic seems to be a partial (at least) tip-bearer, meaning the fruits form at the end of side-stems, rather than along their length. 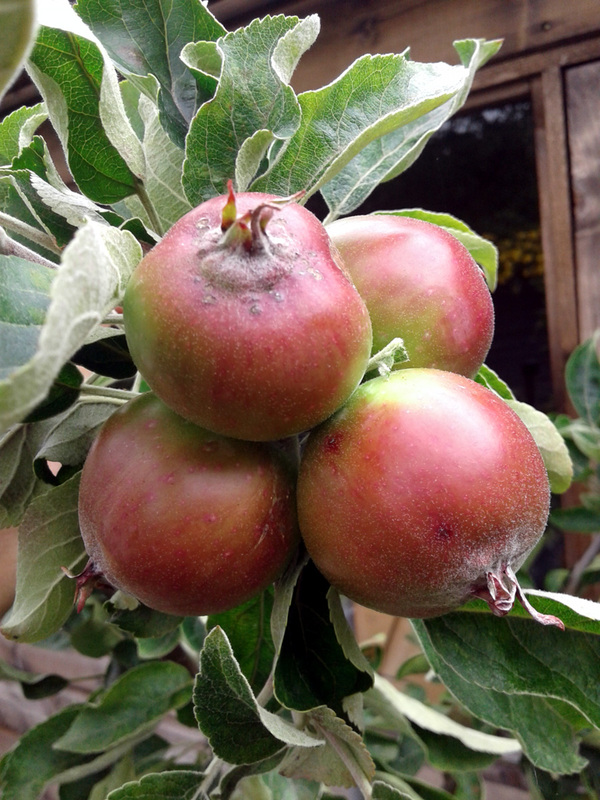 Cornish Aromatic earlier in the season, pre-thinning, with a cluster of tip-borne apples. One of next year’s apples, waiting in the bud? Here’s hoping it forms fruit. A candidate for pruning, if only to stop the height of the tree getting out of hand. A quick snip to the top-right and that’s one tree done. 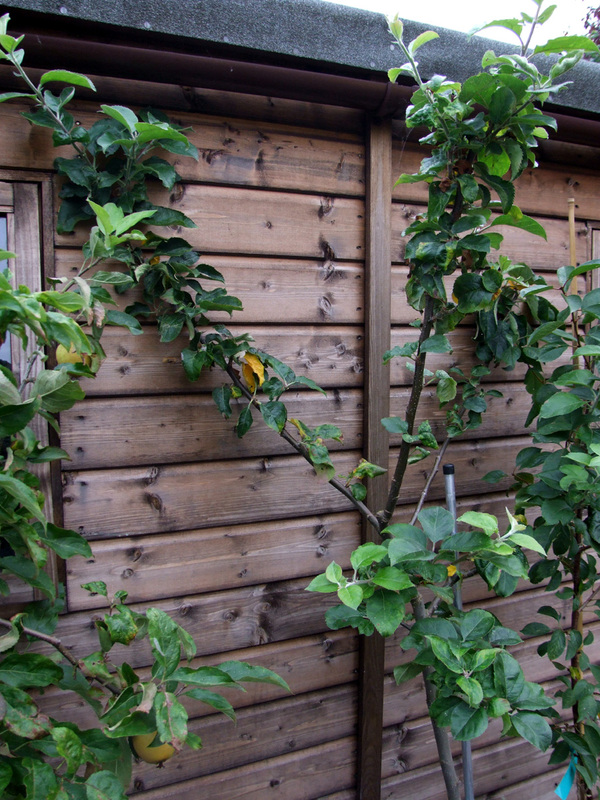 Still a half dozen apples ripening on this tree, hopefully ripening nicely. Our second tree has been slower to put on new growth this year, but did produce a fairly prolific crop of apples, which were thinned down to a half-dozen over the course of the spring and summer. Definitely a spur-bearer this time, so an ideal candidate for Modified Lorette shaping in years to come, but not much to prune this time around. There’s really not much here that can be pruned under the Modified Lorette system. Lots of new growth but no usable fruit this season. Better luck next year, hopefully. 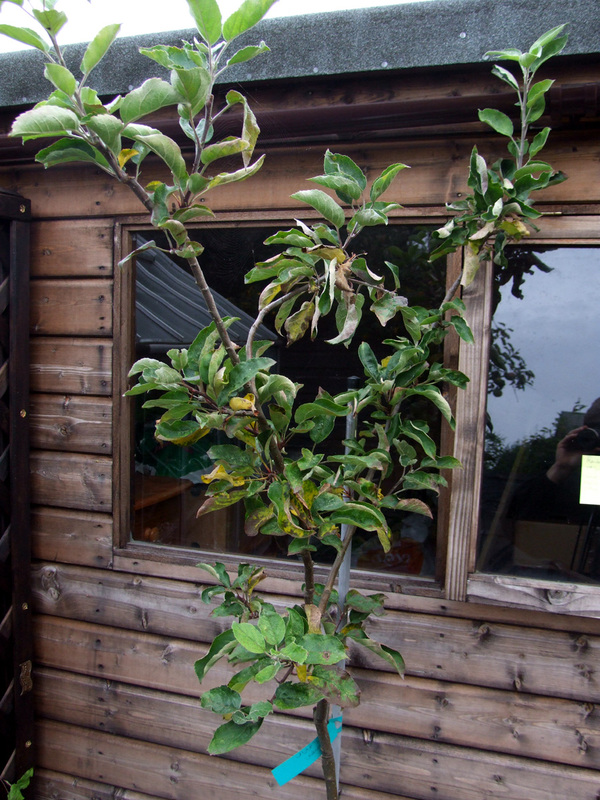 Our third tree produced one lonely little apple which dropped from the tree in July, so no harvest at all this year. Lots of fairly vigorous growth instead, so a bit more pruning to be done here. This leading stem was given a trim to bring it back under control. Bringing a leader or two back under control should help shape the tree and hopefully prevent it becoming too leggy and thin. And hopefully some of the spurs that are developing will be more fruitful next year. Plenty of strong growth in its first season from our new cherry tree. 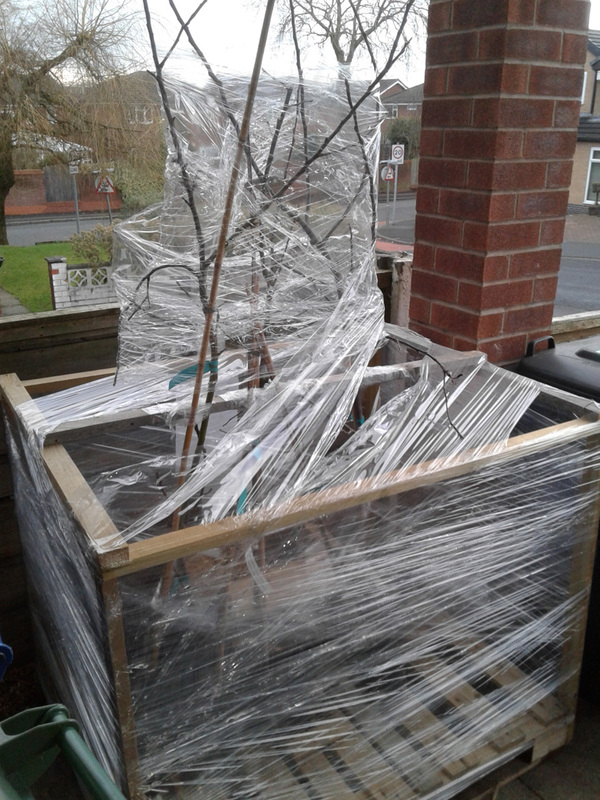 Although we had a fair bit of blossom earlier in the year, and I took steps to cover the tree with a Cherryaid mesh sleeve once it looked as though the blossom had set, we didn’t have any fruit this year. The tree seems healthy enough otherwise, with good new growth. I’m going to aim for a fairly compact standard instead, maybe some sort of weeping form. To that end, I’ve trimmed or rubbed off the buds to about half-way up the stem, and we’ll see how things develop next year. A few side-shoots to trim and buds to rub off further down. Not a lot to remove this time around. 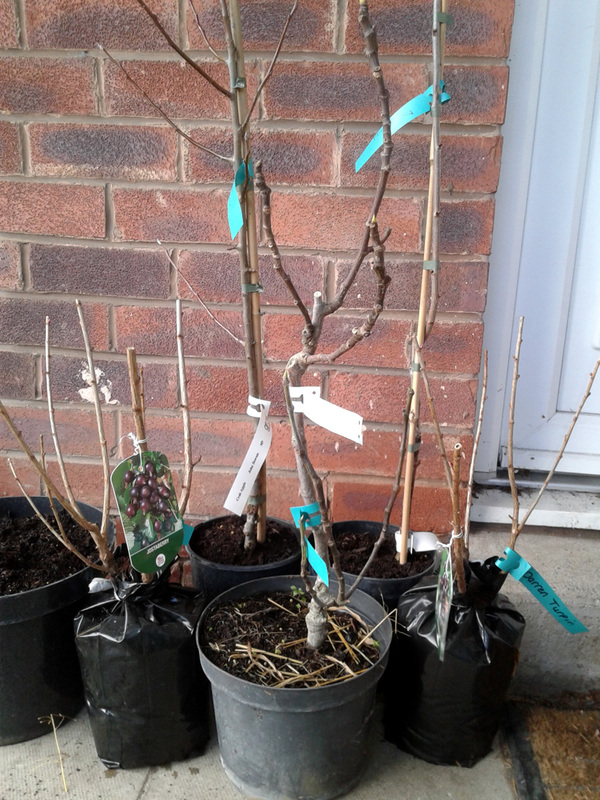 As you can see, I really didn’t end up pruning too much from the apple trees this time around, although I did make a few more cuts earlier in the year as I mentioned. I need to re-visit my research on feeding regimes to make sure the trees are getting the nutrients they need at the time of year they need them. Calcified seaweed feed will be on the shopping list to make sure the slight bitter pit that we had on the Cornish Aromatic doesn’t become a regular feature. I’ve already bought a soaker hose, which might help provide steady irrigation when the weather is drier, rather than drenching them every couple of days. And some sort of organic aphid control is a must, as we had a few cases of woolly aphid to contend with this year. On the whole though, I’m happy that the trees have grown well in their first year and are starting to strengthen. I’ll continue to carefully prune them according to the modified lorette (or not, for the Morello) and see how they go in years to come. I’m going to replicate the key information from all three above-mentioned source articles here, mainly for my own reference but also in case the original pages are taken down for any reason. Pruning should be delayed until the basal third of new shoots has turned woody and growth is slowing down (to reduce the amount of frost-vulnerable secondary growth). 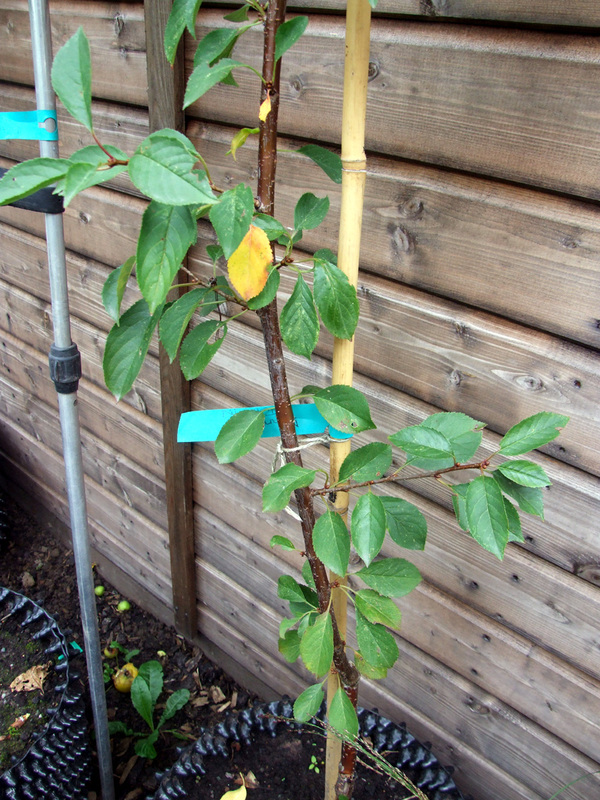 This is usually from around mid-July (pears are normally ready for pruning a couple of weeks earlier than apples). (not counting the leaf clusters at the base). 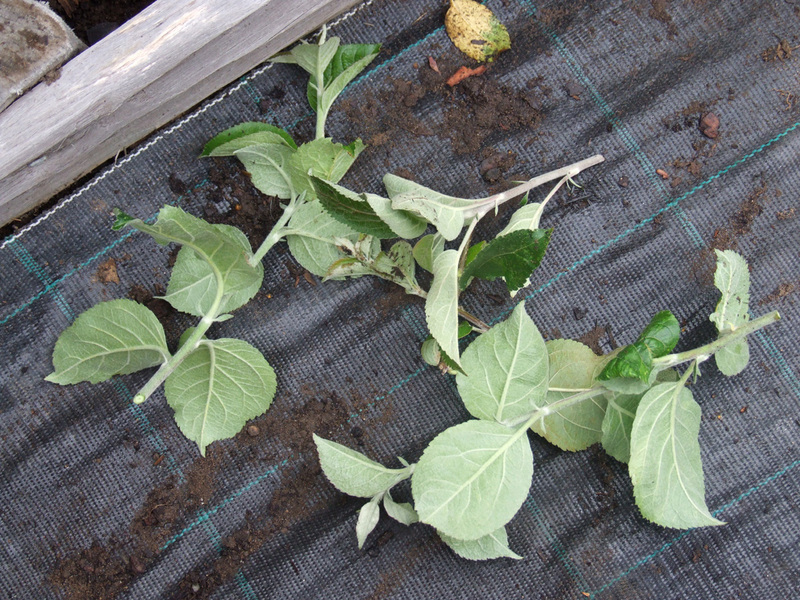 These short stems will then become the spurs where the fruit is produced. secondary growth formed and then removed in the winter. Side shoots on more mature laterals should be cut back to one leaf above the basal cluster. Any secondary growth produced should be cut back to one or two buds in September, or over the winter. [Modified Lorette] Pruning does not start until the basal third of a new shoot has turned woody, and growth is slowing down. Timing will depend largely on the weather and which part of the country you are in. Prune too early and the basal buds will break and produce soft growth for the winter. 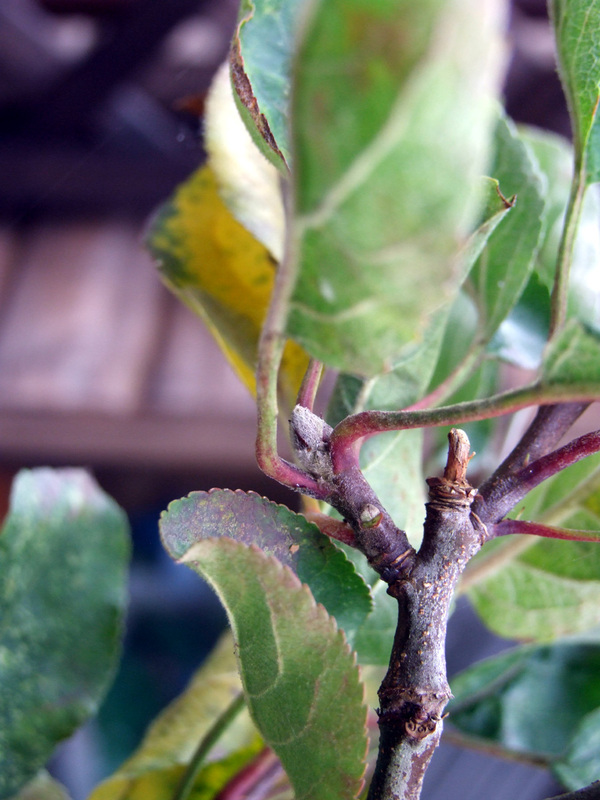 Prune too late and the basal bud will not turn into a fruit bud before the winter sets in. Once the permanent framework is established pruning cuts are made to one bud from the main stem, if it is the first time the shoot is pruned then cut to 3 buds to help form the spur system. Pruning is best spread over a 2-3 week period and to further discourage secondary growth, a few vigorous shoots may be left unpruned to act as ‘sap drawers’. Shorten sap-drawers in the spring. It is recommended that shoots shorter than 9 in should be left unpruned as these often have a flower bud at the top. I find over time that these short shoots tend to produce vegetative side shoots that gradually force the tree further away from their supports, so I prune some of these out. 1. Don’t prune in the winter, except for removing main branches from the framework of the tree. 2. Don’t prune until around the middle of June. At this point in the season, leaves and new shoots are almost fully mature. 3. Only remove branches when they are pencil thickness. Make cuts almost to the base of the branch. Fruit spurs will form as a result where each year fruit will form. 4. Every 30 days of the growing season after the first pruning, remove any branches that are now large enough. In cool climates, a Modified Lorette System is practiced: one pruning in mid-August to the third leaf of all pencil diameter branches, followed in winter by removal of those same branches down to almost the base where fruit spurs are forming. All of which I find rather fascinating. 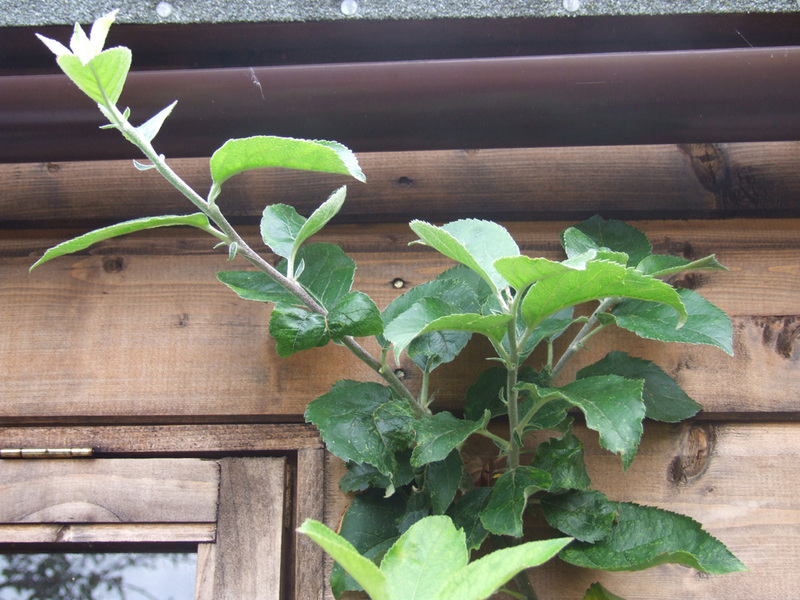 The three apple trees that we potted up into our Air-Pot mini-orchard are all doing very well so far. After blossoming profusely back in May they’ve all set fruit quite well; a couple of them maybe too well. Coming along nicely, but a bit too crowded for comfort – time to thin them out. As you can see, there are four healthy fruitlets developing at the tip of one branch. This is lovely to see, but it poses several potential problems. 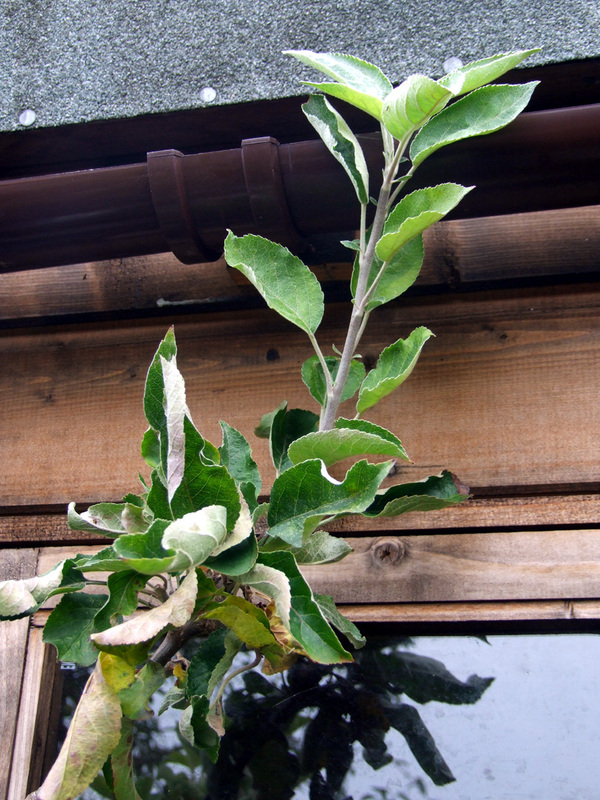 Firstly, too many fruit at one branch tip, getting heavier as they grow, will cause the branch to bend and possibly break off later in the season. Secondly, if the tree puts out too much fruit in one season it may exhaust its energy reserves and that could prevent it developing fruit buds for next year. And the main reason: we’re establishing these trees for long-term growth in their Air-Pots and so we’d really like them to focus on developing their roots, rather than fruiting. It’s all about establishing a healthy basis for longer-term harvests, and that’s why I’ll be out later on with my sharpest scissors to thin those clusters of fruitlets down to one or maybe two fruitlets in each, rather than the three or four that are there at the moment. 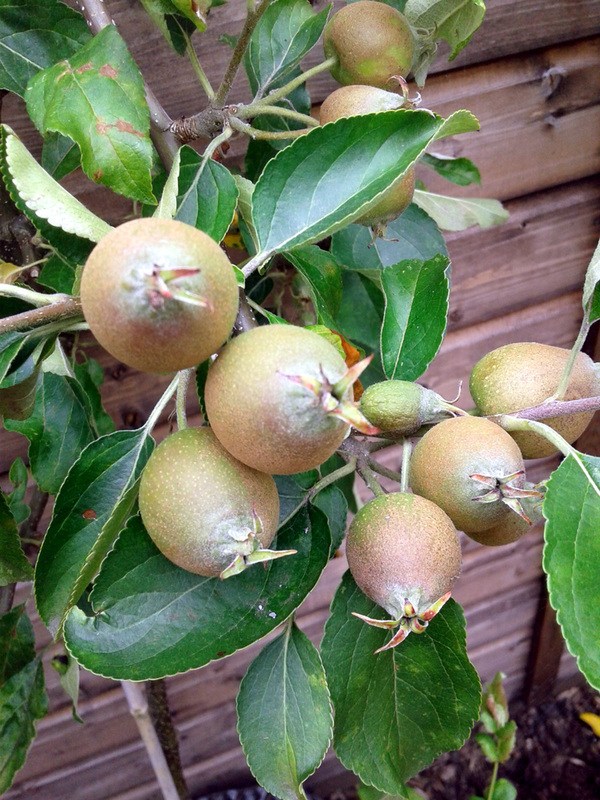 Small but perfectly formed, these russet apples will be delicious when ripe. This one is a spur-bearer and so the fruitlets are more widely spaced, which makes them easier to assess for thinning. Again though, I won’t be leaving more than maybe five or six fruitlets on the tree this year. It’s best not to be greedy now at the expense of future growth and harvest size. Finally, our Belnheim Orange only has three fruitlets on it this year, so I’ll be leaving that along to do its thing.